Please read this entire page, as well as "Notice Based on the Law Governing Specific Commercial Transactions". 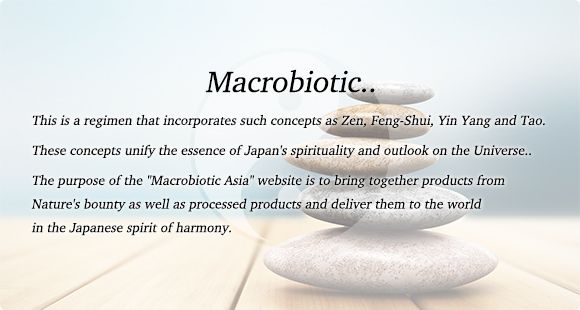 Macrobiotic Asia is owned and operated by Prema Inc.
A sales contract is considered finalized when Prema Inc. sends the order confirmation e-mail to you. If you wish to cancel an order after the sales contract has been finalized, please contact our customer service center. If you wish to exchange or return a delivered product, you must contact Prema Inc. within 7 days of its arrival. The following types of products cannot be canceled, returned, or exchanged regardless of the preceding provisions. If you receive a product that is clearly defective or the wrong product, Prema Inc. will pay the shipping costs associated with its return. If you wish to return a product for other reasons, you are responsible for the shipping costs. Prema Inc. assumes no responsibility for defects in products sold, except as described in the previous section. The product photographs featured on Macrobiotic Asia depict the actual product. However, colors and other attributes may appear different when viewing the product through a computer monitor as compared to viewing the product directly. Please understand that Prema Inc. cannot be held responsible for delivery failure or garbled text in e-mail sent by Prema Inc. to you or sent by you to Prema Inc. When multiple products are ordered at once and one or more items are out of stock, Prema Inc. may at its discretion delay shipment until all ordered products are ready. Products are shipped in standard export packaging designed to endure international shipping. Unless a separate agreement exists, risk of loss or damage passes to the customer at the time products are transferred to the ocean or air freight carrier in Japan. However, Prema Inc. retains ownership of the products until all associated costs are paid in full. Prema Inc. assumes no responsibility for non-fulfillment or delay in fulfillment of product shipping or contract obligations due to war, civil strife, riots, labor disputes, epidemics, fire, floods, earthquakes, embargos, government order, or other circumstances beyond the company’s control. All conflicts, disputes, and differences of opinion that may arise between parties regarding this contract or related matters and that cannot be settled by the parties themselves shall be finally settled through arbitration in Japan according to commercial arbitration rules of the International Commercial Arbitration Association. Judgments rendered by arbitrators are considered final and binding for both parties. The finalization, validity, fulfillment, and construe of this contract are governed by the laws of Japan. This contract is effective as of 1/10/2010. This Membership Agreement shall apply to all membership usage of the shopping site “Macrobiotic Asia” , operated by Prema Inc.
2) Allow third parties or other members to use Macrobiotic Asia without the consent of Prema Inc.
6) Use, disclose, or transmit information gained through the site without the consent of Prema Inc.
9) Other acts deemed inappropriate by Prema Inc.
1) The member notifies Prema Inc. that he/she wishes to relinquish membership, and Prema Inc. accepts this. 2) Prema Inc. determines that the member has engaged in one or more prohibited acts as listed in Article 4. Rights to written works provided on Macrobiotic Asia belong to Prema Inc. unless specifically indicated otherwise. Members may not use such works outside the context of private use. Prema Inc. may freely use written works registered by members on Macrobiotic Asia as it sees fit, as such use is necessary to the operation of Macrobiotic Asia. Members shall not assert nor exercise rights to written works they register on Macrobiotic Asia. Prema Inc. shall not, in principle, disclose to external parties personally identifying information (name, address, telephone number, e-mail address, etc.) provided by members during application without the member’s consent, except insofar as it is necessary to entrust such information to third-party trustees in order to provide services on Macrobiotic Asia. Details on handling of personal information can be found in the separate “Privacy Statement”. 1) Conservation, inspection, repair, or modification of Macrobiotic Asia or its installation environment. 2) Unforeseen circumstances such as fire, electrical outage, earthquake, volcanic eruption, flooding, tsunami, war, riots, or labor dispute. 3) Other reasons as deemed necessary by Prema Inc.
Prema Inc. assumes no responsibility for any losses resulting from changes to the content of Macrobiotic Asia or discontinuation or termination of service provided on Macrobiotic Asia as directed by Prema Inc.
Prema Inc. assumes no responsibility for the content or maintenance of information registered by members on Macrobiotic Asia. Prema Inc. reserves the right to modify or delete information registered by members on Macrobiotic Asia as it sees fit. Prema Inc. assumes no responsibility for wrongful use of user IDs or passwords by third parties. Prema Inc. assumes no responsibility for any other losses resulting from use or loss of use of Macrobiotic Asia. Prema Inc. reserves the right to make changes to this agreement as it sees fit. Prema Inc. shall notify members of changes to this agreement in a manner it determines to be reasonable, such as posting them on Macrobiotic Asia. Changes to this agreement shall take effect 30 days from the date of notification, or at a time and date specified by Prema Inc.
Members shall be considered to have accepted changes to the agreement unless they declare their intent to relinquish membership between the date of notification and the date the changes take effect. All disputes regarding use of Macrobiotic Asia, regardless of content, shall be governed by the laws of Japan. The court of exclusive jurisdiction for such disputes shall be the court with jurisdiction over the location of the Prema Inc.’s main office. Members are responsible for resolving disputes arising with third parties or other members at their own expensive. This agreement is effective as of 1/10/2010.